The alarm went off at 5:10 am. We tried to be as quiet as possible so as not to wake our roommates but that attempt didn’t last long as Laurie failed to stifle her laughter as Andy looked high and low for his boxers. Laurie continued to laugh harder and harder – it was one of those moments when you know you shouldn’t be laughing and that almost makes you laugh more. Eventually Laurie controlled herself enough to remind Andy they were hanging on the bunk bed ladder. This always happens. When Laurie puts something away or reorganizes, Andy doesn’t know where to find anything. Sometimes it’s frustrating, other times it’s funny. We enjoyed breakfast while waiting for the sun to rise and light up the trail. With full bellies and a pink sky, we hit the trail at 6:15am. 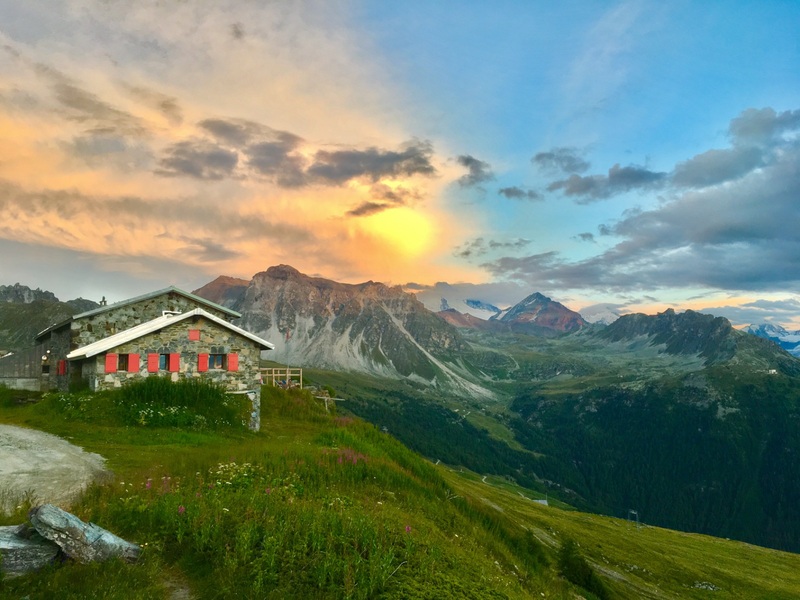 It was refreshing to be walking in the morning air, watching the sun kiss the tops of the surrounding mountains and glaciers. 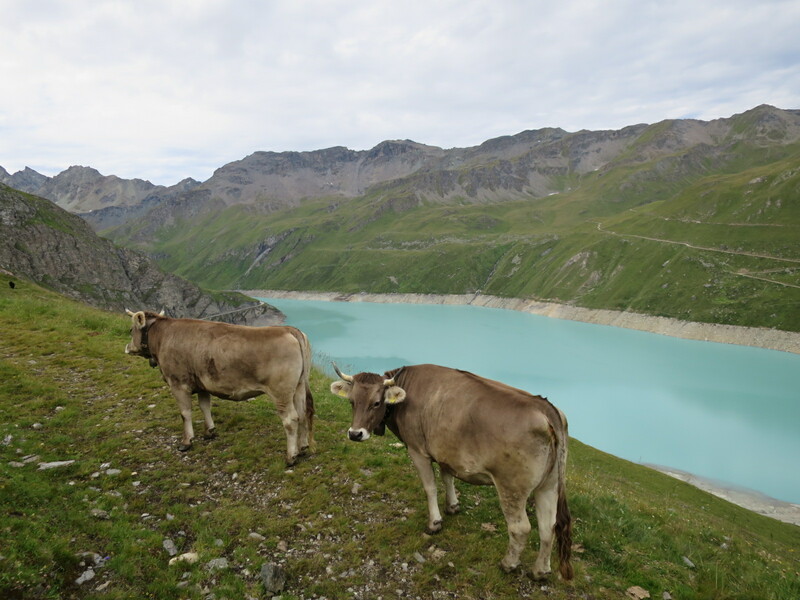 We carefully made our way down the slick rocks, taking a high traversing trail around the Lac de Moiry. Near the dam the trail widened to a disused road and we were met by a bunch of cows. Some stared at us as we walked past, others walked toward us. Not sure if they were curious or defensive we talked to them with our poles on guard in case they charged. Eventually we had a clear, grass covered path ahead. Shortly after, a small trail branched off the road and we switchbacked our way up toward the Col de Sorebois. The cloud cover kept us cool but the uphill was unrelenting and we were both drenched in sweat after less than 5 minutes. Andy distracted himself by looking for ibex and chamois and eventually saw two groups of chamois. They are graceful animals that from afar look similar to ibex but have much smaller horns and are slightly smaller in stature. 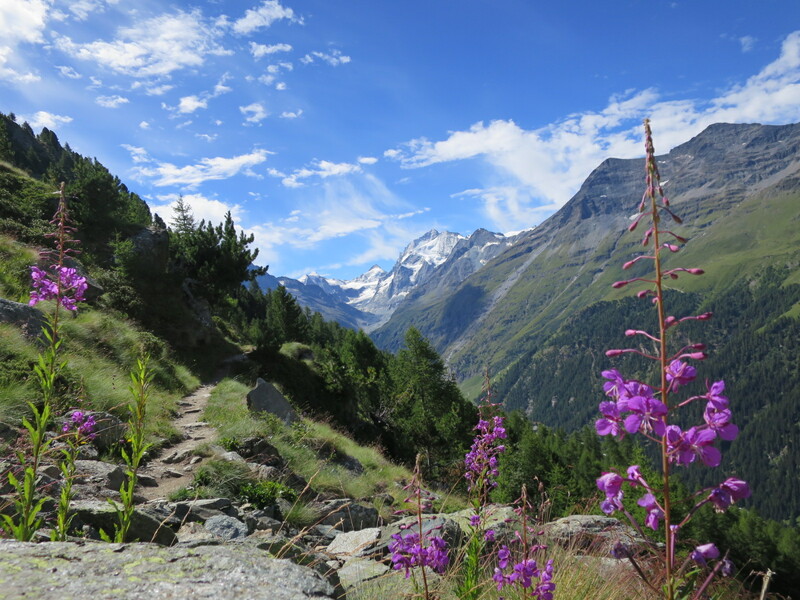 At the col, we paused for a moment to take in the views before heading down toward Zinal. This side of the pass was covered in ski lifts. Andy, who has only skied once in his life, wants to come back here some winter to ski with views of the Glacier de Vinal. 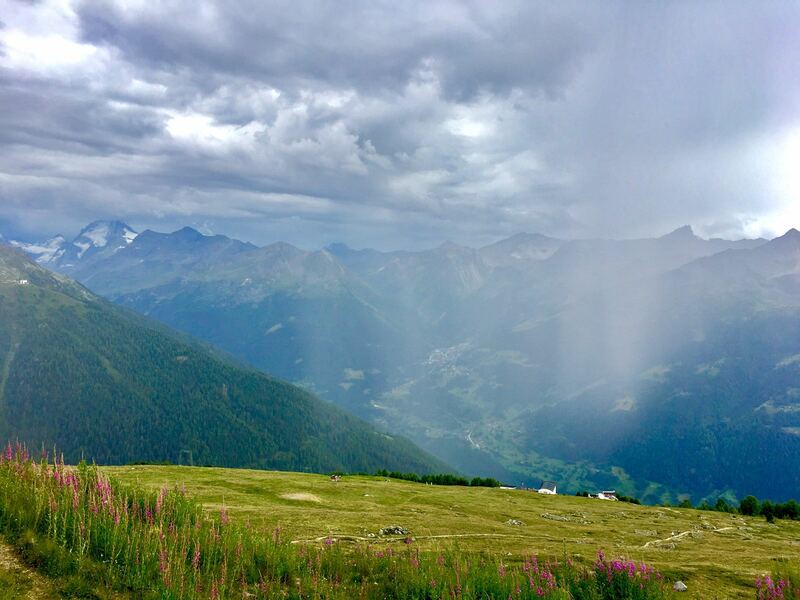 At Sorebois﻿ we opted to take the gondola down to Zinal. It was a long descent and taking motorized transport saved our knees and a lot of time. It was a win/win! 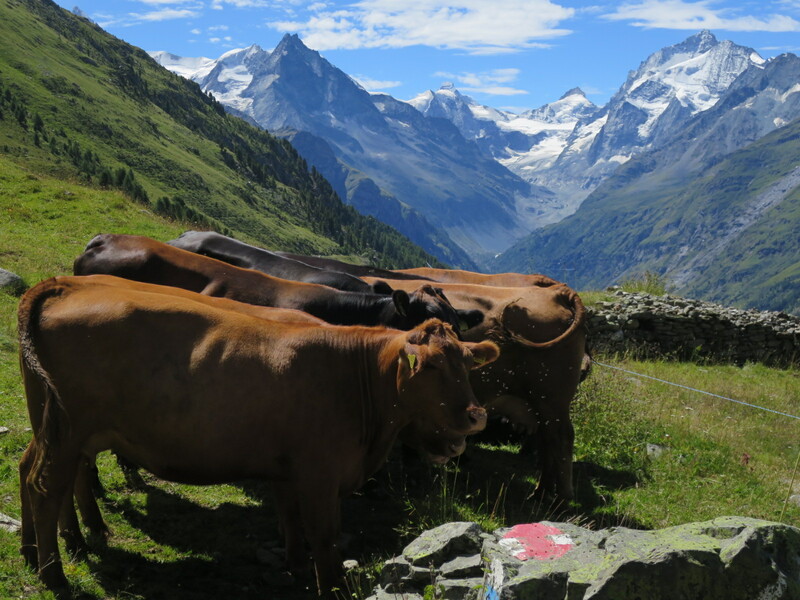 Once in Zinal we walked 100 meters to a public water fountain. It is wonderful how each town, even the small ones, have potable water running for everyone to enjoy. 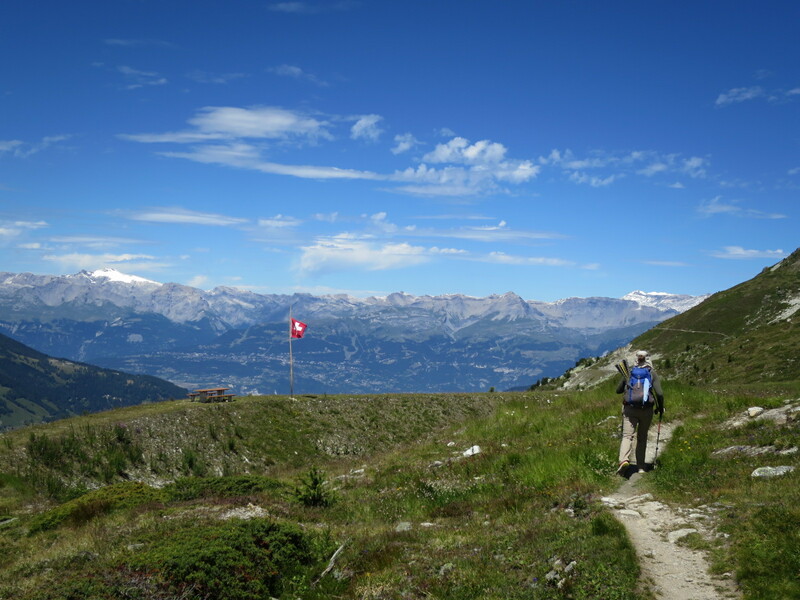 We wandered through the streets of Zinal following the yellow markers and whenever in doubt we walked uphill. Eventually we found the path that wound up and up through the forest. The trails and routes in this country put other trails to shame when it comes to steepness. “I feel silly for complaining about how steep the trail was at times in Washington State and Northern Yosemite. These trails make the PCT seem like a piece of cake” Andy commented ﻿while wiping sweat from his brow. 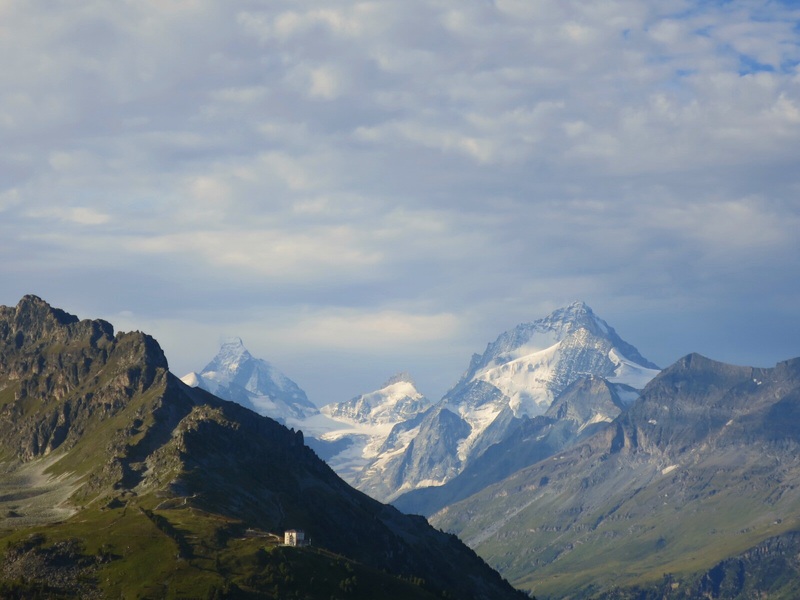 The mountains and glaciers above Zinal provided a nice backdrop when glimpsed through the trees. Mercifully the trail leveled out 5 minutes later and we traversed the green hill sides for miles. The mountains ahead and behind us were absolutely beautiful. We were attempting to outrun an incoming storm on our longest hiking day yet but couldn’t help stopping and gazing at the jaw dropping scenery. “They say this trail will make you want to hike walking backwards; I now know what they mean” Laurie commented. With dark storm clouds closing in, we picked up our pace and for the first time this trip beat the projected times from point to point. We were on a mission. But then it all went wrong. Cabane de Bella Tola is not very well marked. It’s not on any of the signs except one, much closer to its actual location. So we followed the directions from our guidebook but ended up climbing a steep road only to backtrack after asking a few locals who responded with facial expressions indicating that we were way off. Andy was annoyed, tired and ready to be done. But he kept walking. Laurie tried to stay upbeat and focus on the positive which was that it wasn’t raining yet, although the sky was getting darker and darker. Eventually we came across the one sign that mentioned our cabane for the night. It pointed in the direction of a road which forked 10 seconds later. We choose the high road because everything seems to be located uphill. Unfortunately this road dead-ended at a ski lift. We quickly made a plan and walked through grass and rocks to connect with the lower road. By now the dark clouds were overhead and we could feel raindrops. Thankfully this time we were on the right trail and made it to the hut 30 minutes later. 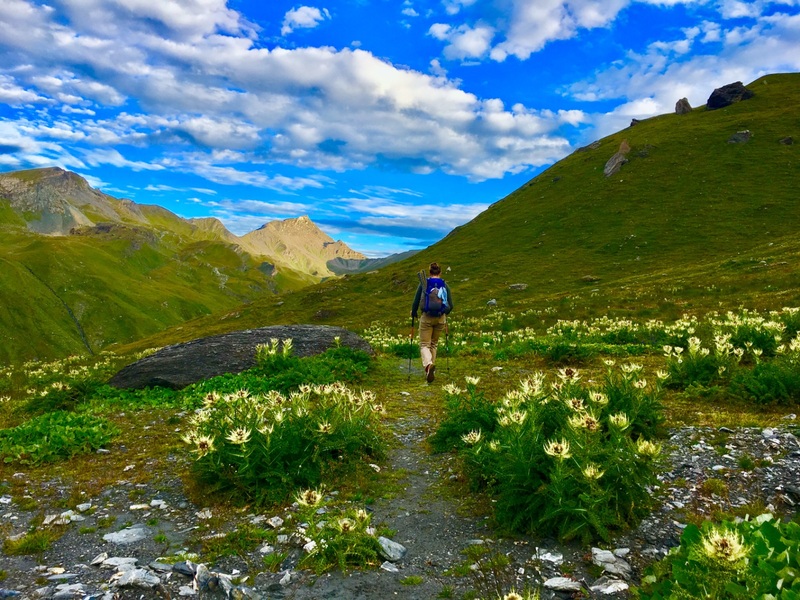 “The trails are really well marked and easy to follow until they aren’t” Laurie said unbuckling the straps of her backpack. We were happy to finally be “home” but the last hour of wandering was a bitter end to a delightful day of hiking. Laurie ate an apple on the deck of the cabane, choosing to cool off outside before we checked in. With our body temperatures stable and feeling calm and happy to be done for the day, we walked in. The rain began about 20 minutes after we arrived. It was nice to hear it pitter patter on the roof of the cabane rather than the hoods of our raincoats. While giving us a tour, a staff member informed us that the showers were free. Most cabanes charge 5 Swiss Francs for this privilege. Even better was when he showed us to our empty dorm room. As it turned out, no one else joined us in this room so we had it all to ourselves. After a lasagna dinner we retired to our room to find that we had free wifi too! It just kept getting better and better. While the dorm wasn’t as clean as we’d like, the free amenities more than made up for this. We attempted to watch the sunset but Laurie was too tired to stand and wait. She went upstairs to go to sleep while Andy stayed to watch the show, which once again, did not dissapoint. By 930 Andy returned to the room to find Laurie half asleep reading the guidebook. We snuggled for less than a minute and Laurie was fast asleep. Andy blogged for about 15 minutes until his eyes too became very heavy. Tonight we are grateful for friendly locals and a cheesy dinner. The cows are more stubborn than Laurie!